I've been seeing a bit of a problem with my Sunbeam EM7000 and I hope to get some enlightenment on the matter. I've had the machine for little over 3 years with light use (usually 1 coffee a day from it). Since about a year ago, I noticed that I can only brew one shot a day. With the same ground, the first shot goes through fine, but the second shot just won't pull through (it looks like the machine doesn't have enough pressure to push it through). Is this something I can fix at home or it's a sign that the boiler is about to go? Since then, I have just restricted myself to one shot (usually a dual basket) a day and still lasted me a year. Only very recently, I am not able to pull my shot unless I firmly hold onto the group handle as it brews, otherwise the group handle will be forced out explosively during the brewing process. Does that sound like the group seal just needs a replacement? I've never replaced in the past, so I'm not too sure if that is indeed the problem. Or the alternative is just to get a Breville . I think these problems may be trivial for someone that has more experience with machines, but unfortunately I am not one of them. If anyone can shed some light on these couple of issues, that would be very much appreciated! Lock your handle in tighter. Maybe your first grind out of the grinder is stale from yesterdays cuppa. And then the next is fresher so needs to be ground coarser. I had a primadonna and the first shot had to go in bin every day as the grinds were stale. I've taken out the shower screen and replaced the group seal. When I did that, it was well calcified, so took a bit of time to clean all that out. Hopefully that'll fix the problem. I just put enough grounds in the grinder every day as needed, so I don't think that'll be an issue. After clearing the group head and decalcify the machine, the first brew seems fine now, the handle doesn't come out at least. Haven't tested the second brew yet. What grinder are you using? 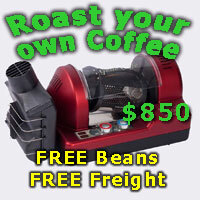 90%+ of all grinders use the weight of the beans to feed the mechanism properly. If you examine your particle spread and it is very uneven, your grinder is one of the majority.